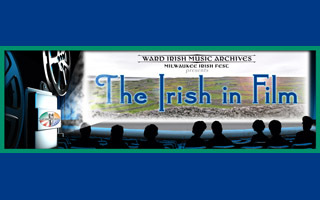 The Ward Irish Music Archives has developed several physical exhibits that explore a number of Irish music and cultural topics. These exhibits are often featured at several festivals and events across the United States each season. Listen to digitized cylinder recordings of Irish music and musicians from the early 1900s! This exhibit explores the early Irish saints and the monastic system for which they are so well known for. 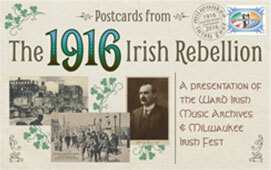 This exhibit is taken from more than 140 postcards covering the 1916 Irish Rebellion found in the Bob Burke Postcard Collection. This exhibit uses photos, baseball cards and sheet music to document the contribution the Irish and Irish Americans made to our national pastime. This exhibit takes a look at all the Irish and Irish Americans that made the sport of boxing so popular in the nineteenth and twentieth centuries. 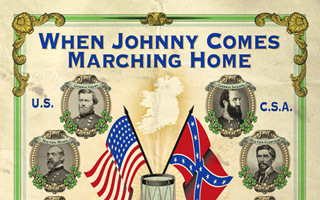 This exhibit explores the Irish in the American Civil War, told through music, stories, and biographies. The Irish in Film examines the Irish and Irish American contribution to the art of film. The History of Irish Rock Music exhibit examines through displays and artifacts the development of rock music in Ireland. 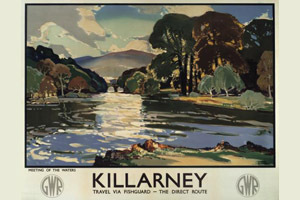 The Come Back To Erin exhibit features a selection of 20th century travel and tourism posters. Topical, educational exhibits that transport highlights of our collections to events across the United States.